TTR (Technical Training Resources) is your one-stop resources for all of your corporate training needs. We specialize in dedicated corporate classes! Our highly experienced instructors offer learning opportunities for high-end UNIX, Red Hat Enterprise Linux, programming, and scripting languages. Working with an instructor, you can create a customized course that best fits the needs of your staff. Stretch your training funds further by using this focused approach. TTR is located 3 miles from the heart of Sorrento Valley. It is easily accessible from both the 15 and 805 freeways, and it is centrally located in San Diego County. TTR's convenient location has a wide variety of restaurants within walking distance. TTR features state of the art classrooms and many amenities to accommodate the needs of our clients. 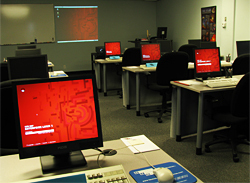 Our three classrooms feature Intel-based systems (Sun Sparc systems can also be used). Classrooms are available for daily and weekly rental.